My review of Catching Fire, the second Hunger Games film was chiefly concerned with two things. First off I did not like that movie’s feeling of incompleteness. This is a problem with a lot of mid trilogy flicks but this one totally failed to stand alone more than any other film I have seen. The other main thrust of the review was my change of heart in terms of wanting to read the books. Suzanne Collin’s novels had never appealed to me and the existence of these films was going to make it even less likely that I would open one up. Frankly now there was no need. Catching Fire changed that though. I’d been left hanging and I wanted to know how the story ended. Now then we come to Mockingjay and, as the final book has been split into two movies, this first part fares even worse in its attempt to tell a complete story. It doesn’t matter to me so much now though as this time I have read the book. This trend of splitting the final tome in a fantasy series kind of has to end. Harry Potter started it, Twilight followed the model and The Hobbit has really taken it to extremes (even though it is technically the first book, not the last). Boy, did that little novel ever not need stretching out over six or seven hours. I know the last one comes out next week but I’m still expecting them to announce it as The Battle of the Five Armies, Part 1. It is hard to see this trend as anything but milking the cash cow and this is particularly true of Mockingjay. Based on what we’ve seen so far, and on what we’ve read, there isn’t really enough here to support two films. Interestingly Mockingjay also feels like it is part of another emerging pattern in fantasy adventure cinema that appears less commercially motivated. We are getting more and more films that are part of an ongoing series and as each one carries more and more backstory fewer concessions are being made to uninitiated audience members. These movies are not even trying get new bums on seats. Even the Marvel movies, that have tried so hard to avoid this, are at a point where you really need to have seen at least some of the previous instalments to get the full picture. The fall of SHIELD in Captain America: The Winter Soldier was only truly significant if you’d been watching the other movies and you needed to have seen Avengers to fully get Iron Man 3. Certainly there is no point in seeing The Hunger Games 3 part 1 if you’ve not seen The Hunger Games 1 and 2. I guess they don’t need new fans, they got enough of the old ones. Especially if they can fleece them for two movies. Mockingjay is more Harry than Hobbit though. I actually got bored in The Desolation of Smaug but I loved every second of Deathly Hallows 1. Splitting the last Potter book gave the penultimate film a chance to explore the emotions and motivations of the main players and Mockingjay 1 does the same thing. Some of the chatter I have heard about the film suggests that it is little more than people talking for two hours. This is not really the case as there are some tense scenes as the rebellion grows and violent acts cause casualties on both sides. That said the talky, frowny scenes do make up the bulk of the film. I maintain that many of these could have been cut or reduced but most of them are nice character moments. It’s a little like watching deleted scenes on a DVD only this time they are all in there, padding out the movie. Jennifer Lawrence continues to be the cornerstone on which everything else rests and her shoulders easily take the weight. I don’t think there are any particular moments of staggering acting brilliance, the likes of which she usually gives us, but she is strong all the way through. 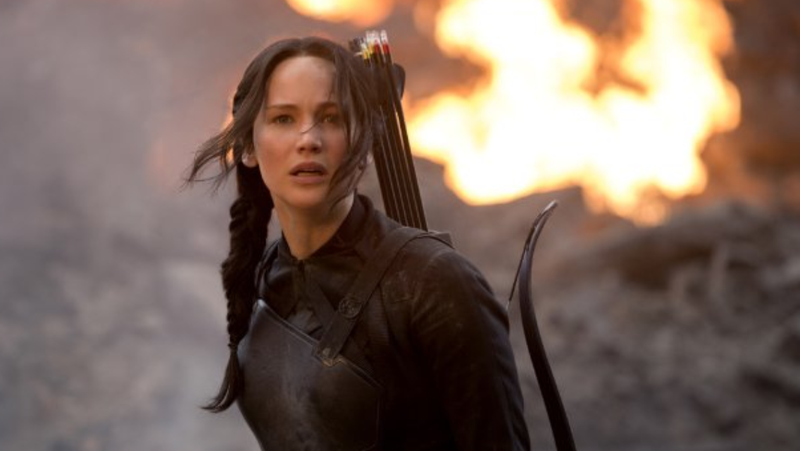 Katniss Everdeen is a fascinating, reluctant, compromised hero and her complexities are key to the whole Hunger Games experience, on page and screen. Of course this and its sequel will also be Philip Seymour Hoffman’s last films and he, again, is reliable rather than grandstanding. Most prominent among the new cast is Julianne Moore and she is also good without showing us what she is truly capable of. Donald Sutherland manages to be more menacing here as well, although that might be due to the mythos they build around the man more than his brief appearances. There’s barely any of Jena Malone which is a big shame. Mockingjay – Part 1 is a good adaptation of the first half of the book. I thought the revelations surrounding Finnick were thrown away a little but it nicely examines how wars are fought with propaganda as well as bombs which feels significant in light of current and recent history. If you are already a fan then you’ll like it. If not then stay away because the film makers are not trying to win you over. If you have an idle interest then I would say wait until it comes out on Bluray and watch it a year from now with part 2, when the story will be finished. The Hunger Games films have always been on the upper edge of the 12A certificate but this one is both weaker and tamer than its predecessors. There is none of the close quarter violence we got in the arenas so if your kids can handle the sight of piles of skeletal human remains they’ll be okay. I did consider calling this recurring section on my blog The Katniss Factor but decided that this would make it look like I was trying to be down with the kids. The fact remains though that Katniss Everdeen is one of contemporary cinemas best female role models. She is pretty but that doesn’t stop her being a feminist icon and Jennifer Lawrence has always been an actress first. She is never objectified, she is not endowed with macho super powers yet she is strong and she is at the centre of her own story. We may get a slightly more emotional version of the character this time round but that is not a weakness and it has always been a good part of the character. This probably only feels heightened as there is less action. Elsewhere we get other strong females in Katniss’ sister Primrose, her mother, District 13’s President Coin and propaganda film maker Cressida. The last two of these could easily have been men and we find ourselves in a situation where gender is almost irrelevant, which is arguably how it should be. We still have Effie Trinket, pathetically trying to accessorise her drab standard issue bunker garb but this takes nothing away from the rest of the film. Quite the contrary in fact, even Effie is finding strength in her own way.